After Cristiano Ronaldo scored with a diving header to bring up his 125th UEFA Champions League strike in Juventus' 1-1 draw with Ajax Amsterdam, he was praised by opposition skipper Matthijs de Ligt, who labelled him "a predator in the box". The five-time Ballon d'Or winner broke the deadlock on the stroke of half-time at the Johan Cruyff Arena on Wednesday night, taking his tally to five UCL goals in the 2018/19 campaign thus far this season. 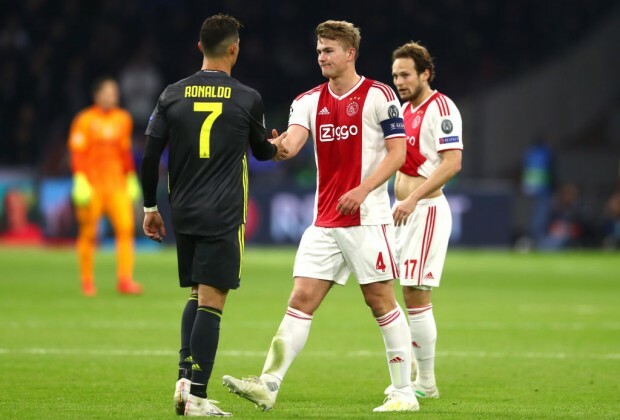 Defending Golden Boy winner De Ligt gave his assessment of the draw after the match, and showered praise on the competition's record goalscorer Ronaldo, who had also netted his 24th goal in the quarter-final stage of the competition in the fixture – more than any other player. "It was a fiery atmosphere from the start and we had a few early chances, but unfortunately conceded just before half-time," the Ajax captain told Football Italia. "Ronaldo's greatest quality, apart from his talent, is that he is a predator in the box. He sees an opportunity, just a tiny gap, and he goes for it incredibly quickly. He sprints into the area between two players. "We know that you can't leave gaps at the back for Juventus, as that's what they prepare for. We passed it around and tried to find holes in their defence. "I think we've done pretty well. We have a team with a lot of potential and that tends to emerge to its fullest in Champions League matches. "We work so hard for each other. We proved today that Ajax are not in the Champions League quarter-finals because they are a fluke. "Of course, Juventus are strong at home, everyone knows that, so it'll be difficult in the second leg." The return fixture of the quarter-final tie will take place at the Allianz Stadium in Turin next Tuesday. Do you think Ronaldo will add to his UCL goals tally in the second leg? Which side will advance to the semis, Ajax or Juve? Have your say in the comments section below. His goals in the UCL are more than some striker's entire careers in all their competitions. Amazing stuff!